Associated Press May 9, 2013 prominent Islamic scholar making a landmark visit to the Gaza Strip declared Thursday that Israel has no right to exist and voiced his support for rocket fire on Israel, giving a boost of legitimacy to the militant Islamist Hamas rulers of the Palestinian territory. Yusuf al-Qaradawi is the latest of a few high profile figures visit Gaza, boosting the Hamas effort to break its international isolation. The U.S., EU and Israel brand Hamas a terror group, while the rival Fatah, which rules in the West Bank, enjoys Western backing. Al-Qaradawi issued the strongest anti-Israel declarations of any of the visitors to date. ‘This land has never once been a Jewish land. Palestine is for the Arab Islamic nation,’ said al-Qaradawi, a Qatar-based cleric made famous by his popular TV show and widely respected in the Muslim world. ‘The rockets made in Gaza are more powerful than the (Israeli) occupation’s rockets,’ he added……. Al-Qaradawi arrived in Gaza late Wednesday to an enthusiastic welcome by Hamas Prime Minister Ismail Haniyeh and his Cabinet ministers. They hosted the cleric Thursday in a tent set up on the site of the prime minister’s office, which Israeli warplanes demolished in 2009. A post from yesterday reported that Qaradawi had arrived in Gaza where he was greeted by the Hamas Prime Minister and called immediately for “Jihad to death” against Israel. 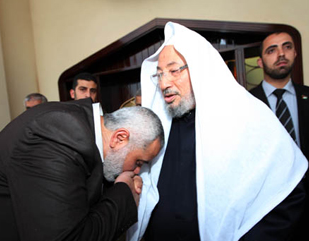 For photos of Qaradawi with Hamas Prime Minister Ismail Haniyeh, go here.